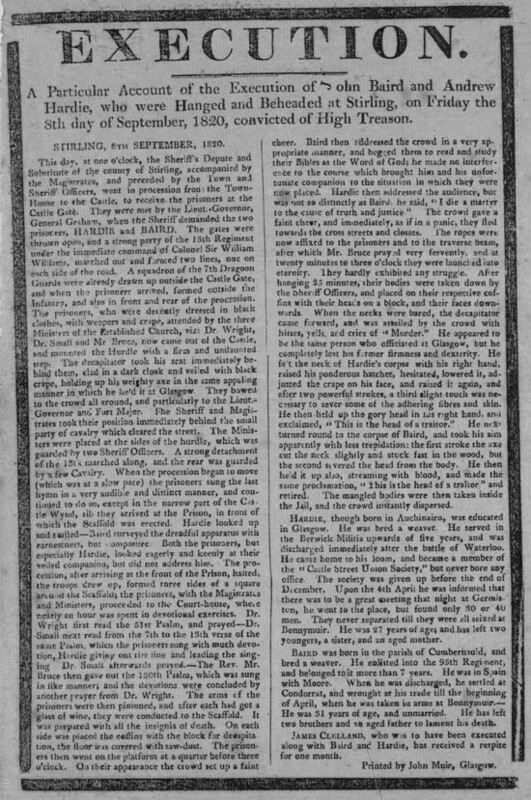 This execution notice begins: 'A Particular Account of the Execution of John Baird and Andrew Hardie, who were Hanged and Beheaded at Stirling on Friday the 8th day of September, 1820, convicted of High Treason.' It was published by John Muir of Glasgow, and like most of his publications would have probably cost one penny. The Scottish weavers Andrew Hardie and John Baird were both tried and convicted of high treason and sedition, and sentenced to be executed for their part in the 1820 Rising. Fighting for universal male suffrage, better working conditions and a Scottish parliament, a group of radicals, led by Hardie and Baird, attempted to seize Carron Ironworks, near Falkirk. They were thwarted by the British army, however, who arrested the radicals at Bonnymuir. As this execution notice illustrates, Hardie and Baird died as martyrs to their cause: in Hardie's address to the audience he announced, 'I die a martyr to the cause of truth and injustice'.